A trip to the pumpkin patch has been a family tradition ever since our kids were tiny. My boys would always pick out the biggest pumpkin they could find...my daughter would choose the tiniest, cutest little one! We still look forward to home roasted pumpkin seeds, an evening spent as a family carving our pumpkins and...and putting our 'Jack O-Lanterns' outside to spookily light the way on Oct.31. Our carved pumpkins are amazing...the kids love them...but they don't last. Every year we have to toss them out. 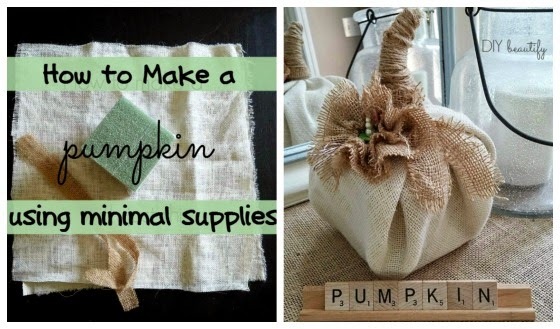 I love pumpkins and have created several DIY varieties that don't turn gnarly and gross. They can be brought out each fall and enjoyed...and then carefully packed away at the end of the season. What makes this pumpkin extra special is that it is super thrifty! It is created from a cube of green florists foam and wrapped with burlap. Step 3: Gather your corners of fabric and tie securely with a rubber band (this will become our stem). Step 4: Spread the 'stem' apart to reveal the inner drop cloth and trim those pieces off...this reduces the thickness of it. Step 5: Take some jute and tie it around the rubber band. 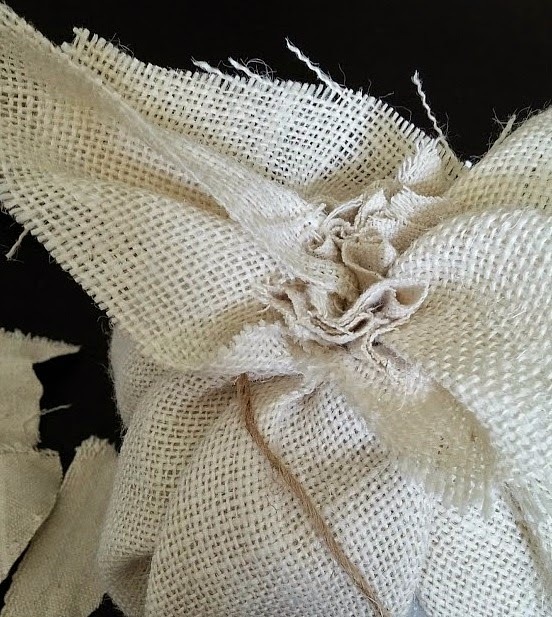 Then tightly wrap the jute up and around the fabric, overlapping where necessary so the burlap is covered. Pull tight! 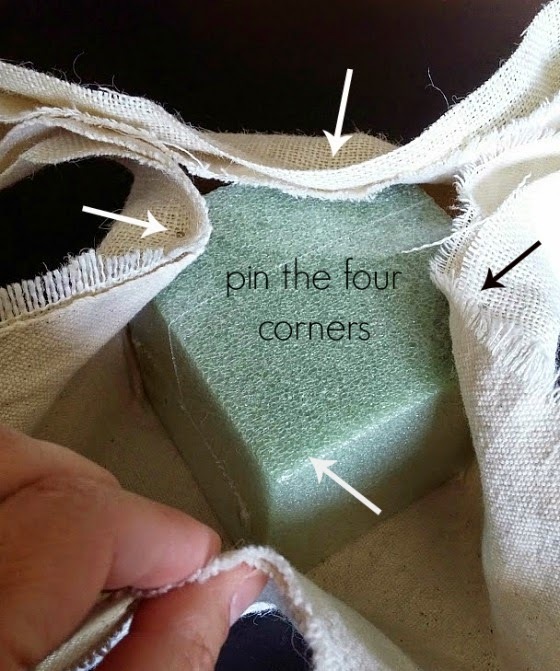 Trim off any excess and either hot glue the end of the jute to the stem or tuck it under one of the coils. That's it! 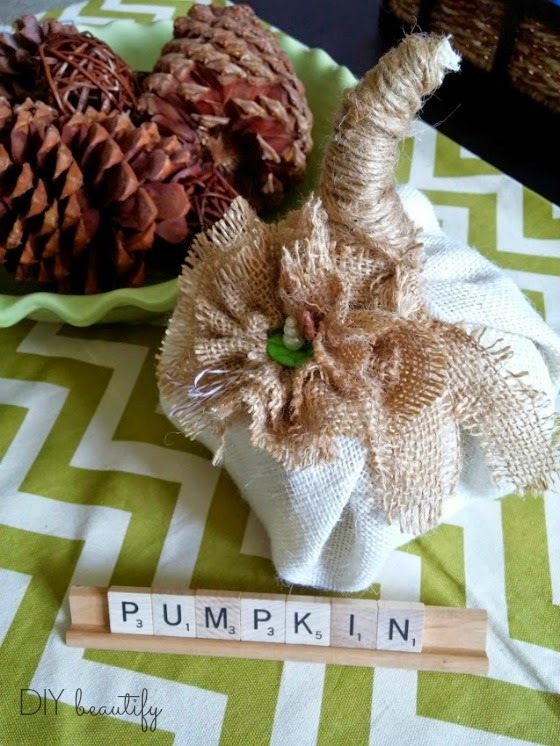 5 Steps to an adorable DIY pumpkin. Wanna take it further and add some embellishments?? 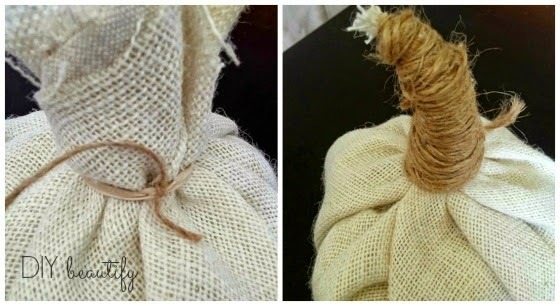 Use a narrow strip of burlap and tie it around the base of the stem. 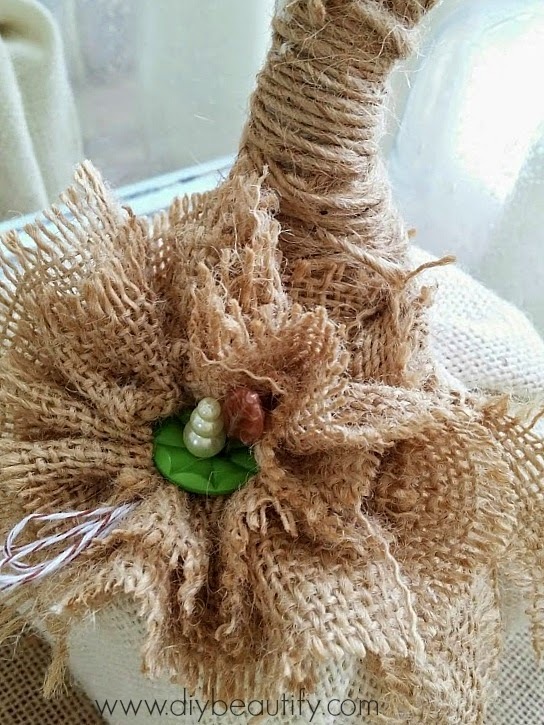 Use another strip of burlap (roughly 12" long and 2-3" wide) to create a burlap flower. 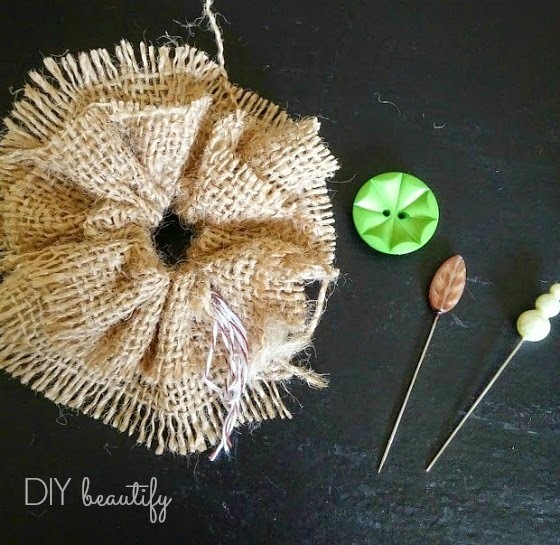 You can follow these instructions to create an easy gathered burlap flower. 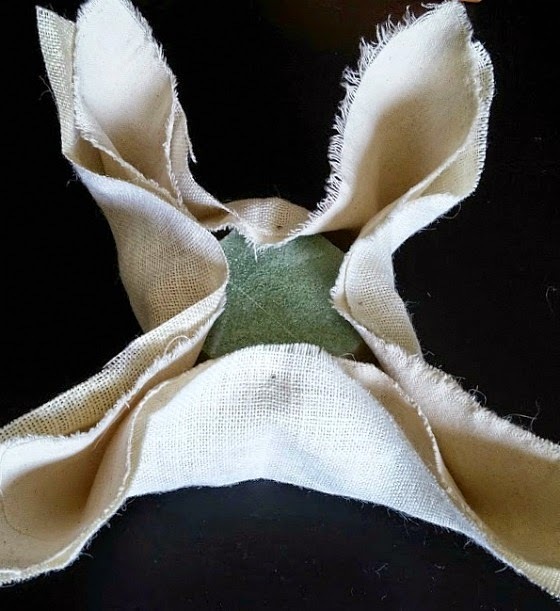 Layer the flower with the button in the center and attach to the base of the stem using pins, poking them through the button holes and into the pumpkin to secure. If you don't have decorative pins or pins with large heads, you could easily glue the flower and button in place. That's it! 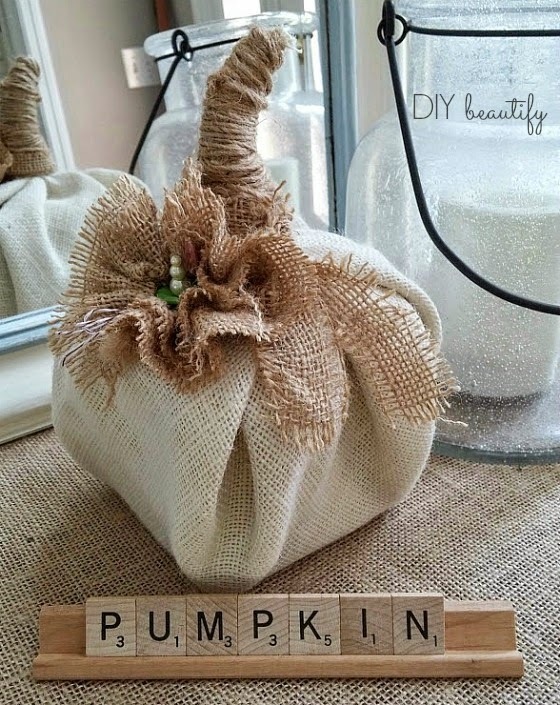 You've just created a thrifty, unique pumpkin for your fall decor! Enjoy your handiwork...and with all the money you saved...you deserve to celebrate with a pumpkin spice latte at Starbucks, lol! Totally cute! These just might make it to my Thanksgiving table this year! I've been looking for something different. This could be a good project for grand kids to do with me. Thanks! You're welcome Val! It would be a fun project for you and your grandkids to do together! I was just saying to some of my friends last night that I need to start using my yards and yards of burlap! You have inspired me! I am going to make these! So happy to inspire you Shambray :) Have fun making your pumpkins! Stinkin adorable! So trying this. I came over from The Blissful Bee. Oh my! I love burlap and I love this!! Pinned! 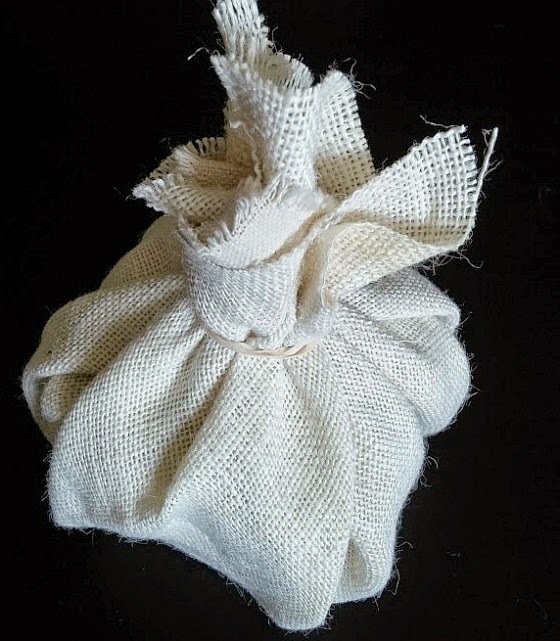 Thanks Elizabeth, I'm a burlap Junkie too!